Some times you wonder why a person entered into the profession they chose. I would like to share my story with you to let you know why I chose to become a Doctor of Chiropractic.Several years ago I could not decide at all what I wanted to study in college, I had no idea "what I wanted to be when I grew up". I changed my major about 6 times and nothing seemed to really keep my attention for too long. So while taking a few classes here and there, I was working full time to provide for my small family at a greenhouse in Pocatello, Idaho. I had been married for about 2 1/2 years and our only child at the time was approaching 5 months. One day I started to get up from a sitting position and my low back "locked up" and I was unable to move. My mind ran through possible options of care 1: Go to the hospital- (didn't have insurance and the hospital costs a bunch of money) 2: Go to the University Student Health Center- (every time I had gone there in the past for other reasons I never felt my "condition" was resolved and I got the exact same type of prescription) 3: I had a church leader who was a Chiropractor who offered student discounts. I was nervous about going to a Chiropractor and had ALL of the typical stereotypes running through my head about Chiropractic but I knew that my leader was a very honest man and a very caring man and he would take good care of me. It took several weeks to get my low back fully under control but I noticed as he would work with my whole spine that I was able to breathe better, my headaches (which occurred almost daily) were getting farther and farther apart and not as strong as before, and other things started to change as well. He started to work with my wife and she started to get better as well from things going on. The real eye opener was with my baby. Yes, I said my baby. She had been diagnosed with an ear infection and had gone through a run of 2 weeks with different antibiotics that didn't touch the infection. During the infection we had been going to the pediatrician 1-2 times per week. After 2 weeks we went back on Monday and the pediatrician said the infection was still the same, he told us to come back on Wednesday and if the infection was unchanged he was going to send her over to get tubes in her ears. On Tuesday, we went in for my Chiropractic appointment and he could tell we were distracted and asked what was going on. We told him the situation and he asked if he could check her out. He had done so well with my wife and I that we agreed to let him check her. He found that the top bone in her neck was out and when he barely touched it our daughter squirmed away in discomfort. He asked for permission to adjust her and we let him. Without much force at all he adjusted that bone and she stopped squirming immediately and started to giggle and coo at him. That night she slept almost the whole night through and in the morning when we went to the pediatrician there was no sign of the infection at all. He said he had never seen a turnaround that quick before and he "was glad the antibiotics finally kicked in and cleared it up". We shared the good news with our Chiropractor who didn't take any credit for himself. He shared with us an important insight/philosophy of Chiropractic: THE POWER THAT MADE THE BODY HAS THE POWER TO HEAL THE BODY! He also explained that this power could only function if the nervous system is communicating properly at all levels. Well, I got really excited about the idea of being able to help people heal and function better without the use of drugs or surgery. I could be a healer by using my hands to detect and correct the misalignments in the spine and then allow the body to heal itself. I started to ask more questions about the schooling required and from that time on I knew I was meant to be a Doctor of Chiropractic. Unlike my college experience in the past I now had direction and focus and I finished my prerequisites and went all the way through Chiropractic College. 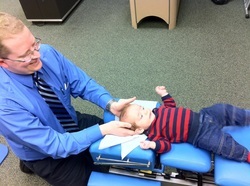 I love being a Chiropractor; it is everything I hoped it would be and more! I love seeing the changes being made in the lives of other people and I look forward to helping many more!